IAESTE trainees have academic backgrounds in Engineering, Science, Information Technology or other technical disciplines and have excellent English. Trainees can work for 2 to 12 months, so are suitable for short-or long-term projects. Employers specify the exact professional and personal skills they require in a trainee and IAESTE Ireland will match them with the best candidate. Employers receive the candidate’s CV, cover letter and academic transcript and can arrange a phone interview if required. Once the employer accepts the candidate for a traineeship, IAESTE Ireland will arrange accommodation for the trainee and meet them on arrival. Members of the IAESTE Ireland Local Committee arrange a social programme for trainees, so they have a peer support system and get to see some of the country! The only cost to the employer is the salary of the trainee, which must be sufficient to cover their living costs in Ireland. IAESTE is a competitive programme so trainees are well motivated and highly qualified. Both the sending country and IAESTE Ireland screen trainees before nominating them for a traineeship, to ensure the best possible match. Trainees bring technical, language and intercultural skills to the workplace and are a valuable source of new international connections. In addition, every traineeship offered in Ireland guarantees a similar opportunity abroad for an Irish student. “We offered three traineeships to incoming IAESTE students, providing them with an opportunity for 10 weeks study with the best research groups on campus. The feedback from the supervisors was uniformly positive, praising not only the educational standard of the trainees but also their enthusiasm and work ethic. This demonstration of the high calibre of the IAESTE student prompted the Dean to repeat his support the next year, with the intention that this marks the beginning of a long and fruitful working exchange with IAESTE. In addition to sourcing outstanding trainees, facilitating them was straightforward, produced minimal paperwork, and was managed throughout by efficient and helpful coordinator-all the hallmarks of a well run programme, with little or no disruption to the daily business of the Faculty. “IAESTE has provided us with a great opportunity to participate in their global student exchange programme. We received applications from some of the best universities across Europe and have facilitated traineeships for top students in our Technical Support team on our Cork campus. Kerrie spent her summer in Tunisia with IAESTE 🇹🇳🙌🏻 😍 #iaeste #internship #WorkExperienceDiscover Léargas. Please head over to leargas.ie/programmes/iae… for more information. You could be headed to Tunisia this summer to travel while being on a paid course related internship. See why Fiona went on her internship and what she took away from her experience in Czech Republic ! @Leargas @iaesteczech #Work #Experience #Discover @tcddublin @UCDEngArch @nuigalway @uccsocieties @UCCSU Head over to leargas.ie/programmes/iae… to see our offers and how to apply!! 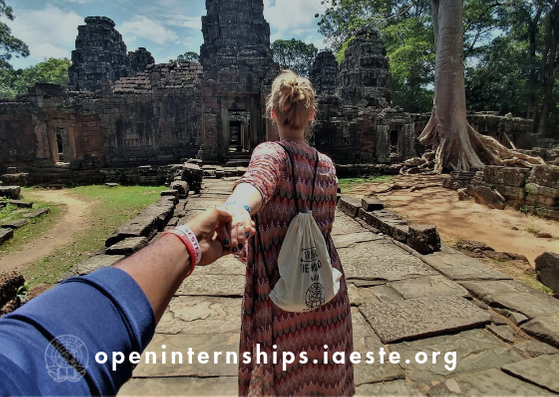 Applications closed for the 2018 IAESTE Exchange programme! 'The biggest thing that I learned from my IAESTE internship was how valuable different kinds of people are, and that showing respect towards people from different backgrounds and culture can make the world a more harmonious and exciting place' - Kerrie Drum, Tunisia 2016.